Nine months before the Nativity of Christ, during the Archangel Gabriel’s annunciation to the Holy Virgin Mary concerning God’s incarnation within Her, a new star of the east appeared in the heavens. This was an extraordinary star indeed. According to the Holy Fathers (Sts. John Chrysostome and Theophilactus), this star was not one of the regular celestial bodies, but a certain divine and angelic power which appeared in the form of a star. All other stars have their own place in heaven, while this star could also be seen in the air; all stars usually move from east to west, while this star moved unusually from east to south, in the specific direction of Jerusalem; all stars shine only in the night, while this star shone like the sun even during the day; all stars are in constant movement, while this star sometimes moved and sometimes stopped, i.e. when the magi traveled, then the star traveled with them, and when they rested, then the star stood, too. This extraordinary star was seen by three magi, or wise men, in three different countries – Persia, Arabia, and Ethiopia. Being learned men, they knew astronomy and studied the stars, and thus, seeing such an unusual phenomenon in the skies, they realized that something supernatural had take place in the world. Then, inspired by God, they remembered the ancient prophecy of another star-gazer, Valaam, who had said: “A star will shine forth from Jacob, and a man will arise from Israel.” The magi realized that the time had come for the Lord and King of the universe to be born, and that this was His star, foretold ages ago. Then each one of them left his own country and embarked upon travel to Judea, in order to worship the newborn God. During their travel they met one another and continued on their way in unison. Traveling thus for several months, the magi finally came to Judea and reached its capital – Jerusalem – on the very day of Christ’s Nativity. However, when they approached Jerusalem, the star that was leading them suddenly disappeared from view. This happened so that King Herod and the envious Jewish priests would not be able to find the Christ-Child and kill Him prematurely, and also because the Jewish populace was not worthy of seeing the wondrous star: the magi were pagans, and yet had come from afar to worship Christ, while the Jews had Him right beside them, and yet disdained Him. Upon entering Jerusalem, the magi began asking: “Where is the newborn King of Judea? We have seen His star in the east and have come to worship Him.” This news amazed the populace and shook up King Herod and all the Jewish leaders. Deciding to kill Christ, in Whom he saw a future rival for himself, Herod summoned the magi, questioned them about the appearance of the new star, and cunningly sent them to discover the location of the newborn Child, in order to subsequently pass on the information to Herod. When the magi left Jerusalem, the familiar star again appeared right away and went before them. It led them all the way to Bethlehem, to the cave, and stopped over the Christ-Child. And then an extraordinary event took place: the star left the firmament and came down to earth, and showed the magi the exact location of Christ. Here was further indication that this was not an ordinary star, but a special divine power. 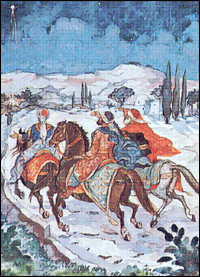 The star leads the magi. Finding Christ in the cave, the magi knelt down to the ground before Him, worshipping Him as God, and gave Him their gifts. What gifts did they bring? Gold, incense, and myrrh: gold for Him as King, incense for Him as God, myrrh for Him as a mortal man. The first magus – Melchior, old and grey, with long hair and beard, – brought the gold. The second magus – Gaspar, young and beardless, with a rosy face, – brought the incense. The third magus – Balthazar, with a dark complexion and a long beard, – brought the myrrh. Afterwards, being instructed by an angel not to return to Herod, who was planning to kill Christ, the magi went another way and returned each to his own land, and there became teachers and preachers of Christ. They taught people to believe in Christ as the Son of God, just as they believed in Him themselves, and after their repose they became numbered among the saints.